Over 10 years ago, HubSpot changed the way businesses marketed themselves by introducing the world to inbound. The inbound methodology wasn't just an empty, fleeting trend. It became the standard marketing strategy. But as buyer behaviors evolve, it's apparent that more change is a must. Inbound marketing is just one piece of the bigger picture – the inbound organization. Your philosophy needs to reach all aspects of your whole team – marketing, sales, and service. This is where the flywheel framework comes into play. This is what an inbound organization looks like – all teams working together and focused on delivering an excellent customer experience at every touchpoint. There are plenty of friction points some companies can experience, but they are indeed preventable. To get your inbound organization fully launched and to avoid these friction points, review all the aspects of this new way of business. The answer is simple: everyone. An inbound organization benefits every company. If you're in B2B or B2C, if you're selling services or products, if you're a large enterprise or if you employ 30 people, your business will thrive when inbound permeates throughout every team. Inbound impacts more than just marketing. HubSpot emphasizes this point perfectly in this video. As they say, inbound is everywhere. In buyer behavior. In marketing. In sales. In service. What Is An Inbound Organization? Helping others is the right thing to do regardless of your economic self-interest. Treat people like human beings. The full customer experience is your best sustainable competitive advantage. Collection and evaluation of data yields the best decisions. This aligns perfectly with HubSpot’s flywheel. It puts the customer in the center of everything. And here at Bluleadz, we agree – the future of business is the inbound organization. Every team, including your finance, operations, and HR departments, must adopt an inbound approach. When Should Companies Make This Shift? The time is now, not tomorrow or 2020. Just as HubSpot paved the road for a new marketing strategy when they first started, this is a new future you can’t afford to ignore. This is Inbound 2.0 – the next HubSpot-led evolution of business. An inbound organization gets everyone rowing in the right direction. When all your teams are aligned, your whole operation is efficient. And efficiency makes growth easier to sustain and replicate for the long term. Yes this change is big, but it’s a necessity right now. Where Does This Evolution Start? The best place to start is at the top. C-suite and senior management need to see the value of building an inbound organization. Unfortunately, many professionals are pushing inbound up but not getting buy in. For example, inbound marketing is working and marketing leadership is telling CEOs that the inbound methodology needs to be applied everywhere. But senior leadership is often stuck in old school mentality. Inbound in every department can't be an afterthought. And if your C-level is not fully invested in this approach, your organization can't evolve. Silos will arise, slowing down your flywheel. Why Is This Change a Necessity? Because just using inbound in marketing is too short sighted. We have seen this with some of our clients. 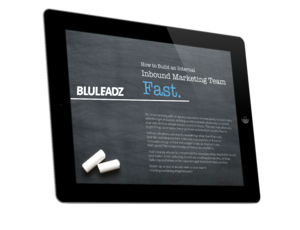 They invest in inbound marketing and generate plenty of qualified leads. But those leads are not handled properly by their sales team. Instead of using inbound sales techniques and tools, they're using cold outreach and not personalizing their sales presentations. They stay stuck in outbound sales. Another common issue we've seen is a lack of sales and marketing alignment. If these departments aren't working together, leads are being lost in the handoff. But even when sales and marketing are aligned and using inbound, their service team often drops the ball with driving customer success and delivering a premium customer experience at every touchpoint. Lacking an inbound service team can lead to customer churn and stall your growth. These silos we see in so many organizations kill their chances of earning sustainable, continuous growth. And simply fighting each silo battle is not fixing the whole issue. This approach is overly focused on treating the symptoms, not finding the cure. The flywheel is built to drive force and fuel itself. This sustainable business growth pays off big over the course of time. Plus it’s a holistic treatment, not a narrow focus on symptoms. We are part of this movement. We are dedicated to helping our clients transform the way they do business at every level of their organization and their culture. It’s hard to start evolving your business if you don’t know where you stand. This is why we offer a free flywheel assessment. Our team of inbound experts look at every aspect of how your business operates to help you identify opportunities for going inbound. Let's get your inbound organization started.